Country N' More has been making neck coolers in the USA for over 15 years. The images show the neck coolers in their dehydrated state, but when soaked the polymer crystals will absorb the water and swell up. 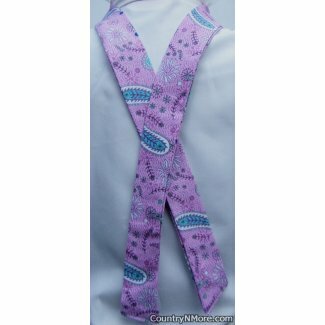 These cool ties measure 43-44 inches in length and have 18 inches of cooling space. We use 100 percent cotton fabrics. With proper care, our neck coolers can keep you cool time and time again. Each neck cooler is packaged separately in plastic zip lock bags. This is perfect for storing your neck cooler when it is dry and ready for storage. This darling neck cooler is unique in every way. 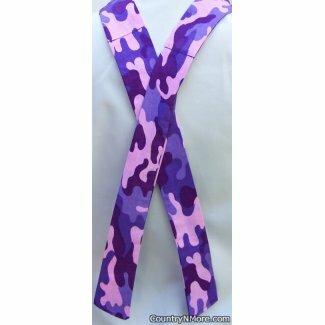 Not only was the neck cooler made from camo fabric, but camo fabric that has frogs and lily pads. This darling floral neck cooler, features dark pink flowers set against a white background. It is perfect for wearing on walks, on activities, or while working out in the yard. Here is an unique neck cooler, that you are not likely to find elsewhere. 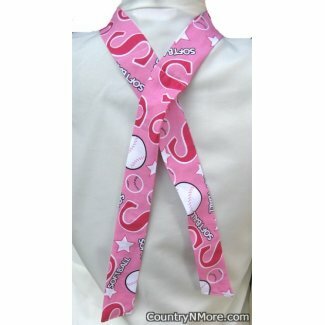 Softball neck coolers are hard to come by, especially neck coolers in pink. There are softballs throughout the neck cooler, and the word "softball." Once these neck coolers are all sold, we will not be able to make anymore. Neck cooler is 43-44 inches long. 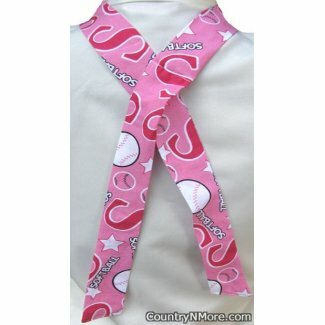 This softball neck cooler is perfect to wear while playing their favorite sport-softball. Now, the young softball players have another choice for neck coolers, that will not only help keep them cooler, but they look cool. These neck coolers contain the crystals that expand when soaked in water. We prefer to soak our neck coolers in cold water. Each neck cooler is packaged separately in plastic zip lock bags. This is perfect for storing your neck cooler when it is dry and ready for storage. 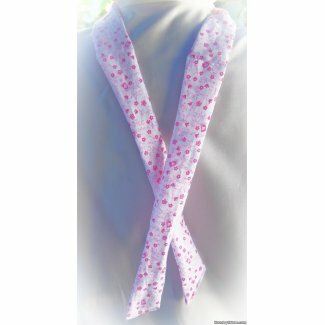 This pink polka dot print neck cooler is for the person who likes pink. 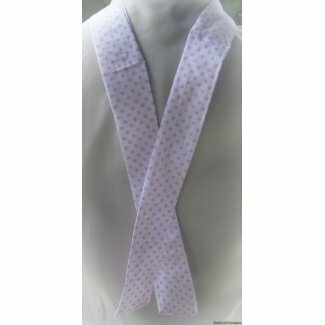 The pink polka dots are set against a white background. This neck cooler is perfect for fundraiser walks. 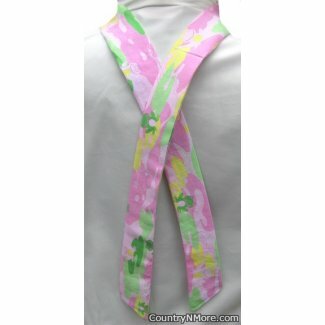 This gorgeous pink ribbon neck cooler is perfect for breast cancer survivors and for fundraiser walks. 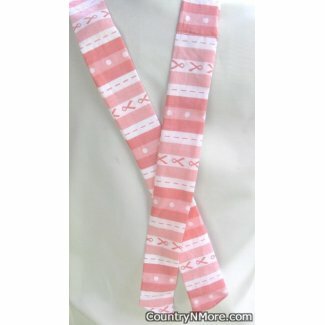 The strip print has bright pink stripes, light pink stripes with white polka dots, white stripes with pink lines, and white stripes with pink ribbons. 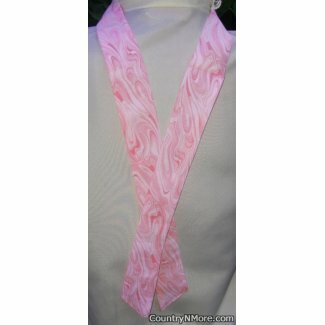 This neck cooler is perfect for the person who likes pink. 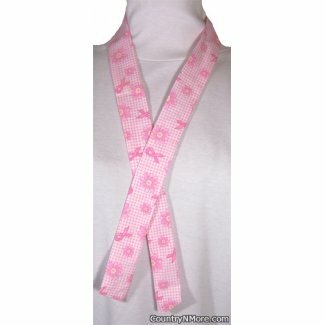 The neck cooler is also perfect for wearing for fundraiser for cancer awareness. 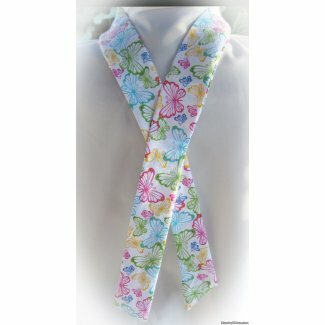 This gorgeous neck cooler is covered with colorful with pink, blue, green, and yellow butterflies. This neck cooler looks and feels so cool. From the pink to the various shades of purple. Here is another neck with class and style. You will find paisleys, small flowers, and larger flowers. 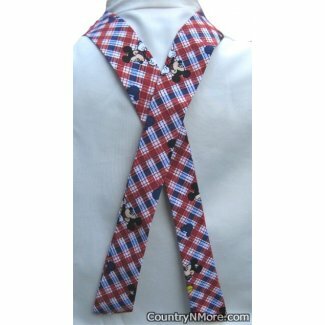 This unique neck cooler was made using a country red, white, and blue plaid Mickey Mouse fabric. You probably will not find this neck cooler anywhere else. It is perfect because not only does it have Mickey Mouse, it is also on the patriotic side. We are not associated with Disney. Quantities are limited to stock on hand. 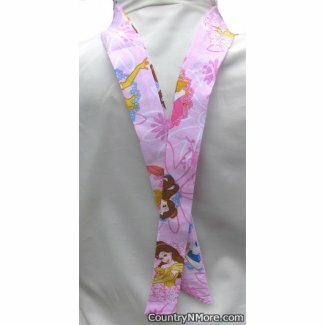 The sailboats are sailing out on the beautiful ocean waters on this neck cooler (coolie). Great for wearing while sailing or boating, or even while taking a nice walk along the beach. 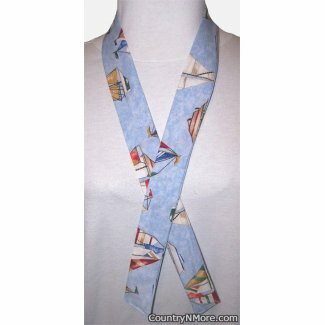 Both men and women alike can wear this sailboat neck cooler This would make a great gift for that special friend or person in your life, who likes to go sailing.